A national controversy erupted in Austria when Vienna’s Mayor Michael Häupl allowed a jubilee-party honoring thirty years of “good work” by Austria’s first abortion clinic with the misnomer Pro-Woman. The September 3 celebration was held at City Hall and provoked a storm of protest including nearly 500 people demonstrating outside during the celebration. Pro-lifers sent hundreds of protest letters to the mayor asking him in vain not to honor the celebration of the killing of unborn babies. They then organized a demonstration outside the beautiful and historic neo-Gothic Rathaus (City Hall) while the pro-abortion event took place in the cellar, complete with music by a feminist jazz trio. Almost 500 people protested outside the celebration. A non-governmental pro-life coalition, comprised of Human Life International, the Austrian Society for the Defense of Tradition Family and Property, Doctors for Life, Die Christen and others, were present in sizable numbers. Over a hundred young people from Youth for Life came from across Austria to join the demonstration. Members of the Centre for Bioethical Reform based in neighboring Slovakia also attended. Prior to the event, Mass was celebrated by Most Rev. Andreas Laun, auxiliary bishop of Salzburg. He saddened worshippers by revealing that the Archbishop of Vienna, Christoph Cardinal Schönborn, had prohibited him from attending the demonstration. Bishop Laun was scheduled to lead the prayers and speak at the demonstration, but Bishop Laun explained “the Cardinal has phoned me and said that I am absolutely not allowed to attend the demonstration. Since he is the local bishop, I have to obey canon law.” Cardinal Schönborn did not give any reason for his ban, nor did he send anyone to take Bishop Laun’s place, a fact which caused much perplexity among the demonstrators. Bishop Laun and Cardinal Schönborn recently clashed over yet another abortion clinic in Vienna when Bishop Laun suggested that a prominent Viennese businessman, who allowed the clinic to open on his property, be excommunicated, whereas Cardinal Schönborn chose to overlook the fact. Participants of the Mass processed the nearly one mile route from the church to City Hall. Nearly 500 pro-lifers gathered at the site where they faced a few dozen pro-abortion counter-demonstrators from the political left. The two groups were kept separate by police. Speeches, prayers and songs made up the three-hour demonstration. Many pro-lifers turned up in traditional alpine Austrian clothes. Children placed candles on the ground near the entrance to the cellar of the City Hall in memory of the countless victims of abortion and the broken hearts of women suffering from feelings of guilt and Post Abortion Syndrome (PAS). One little girl took the podium to thank her mother for allowing her to be born. The pro-abortion demonstrators tried to disrupt the event by insulting, whistling, blaspheming and throwing water-filled condoms at the pro-lifers and their billboards, who remained confidently calm. Such misbehavior was counterproductive, as the onlooking public turned against them and the police pushed the liberals away from City Hall. The mood in the City Hall cellar was muted as many politicians and other VIPs chose not to attend the event which had created so much controversy. Even the mayor did not make an appearance. Abortion clinic staff, feminist activists and socialist politicians who did turn up were taken aback by the great public reaction. 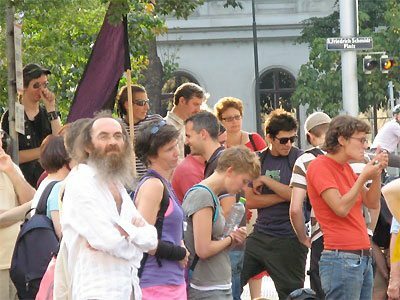 This entry was posted in Events of 2009 and tagged abortion clinic, Austria, Bishop Laun, Canon Law, Cardinal Schonborn, Catholic Bishop, counterprotesters, Michael Haupul, party, Protest in Vienna: Pro-Lifers Demonstrate at City Hall, unborn babies, Vienna mayor by Bruno Schroeder. Bookmark the permalink.